NEW DELHI: The Bharatiya Janata Party president L.K. 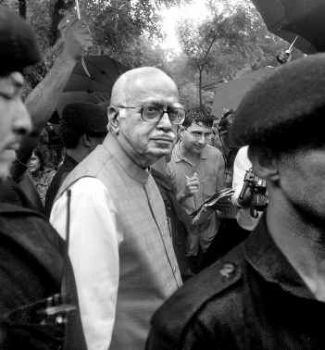 Advani on Wednesday blamed the lax policies of the Centre and the Uttar Pradesh Government for Tuesday’s terrorist attack at Ayodhya and declared that the Ram temple issue had revived once again. Addressing party workers, who were protesting against the attack, he reiterated his party’s commitment to building the Ram temple at Ayodhya. The protest, held barely one km away from Parliament House, turned violent with demonstrators breaking barricades and throwing stones at the police. The police had to use water cannons and lobbed teargas shells to disperse the protesters. "The Ramjanmabhoomi issue, which had got buried, has again come alive after the militant attack in Ayodhya on Tuesday. Our party believes in resolving the issue either in court or through talks between the two communities. But the Ram temple will be built right there," he said and vowed to step up the Ayodhya campaign. Mr. Advani criticised the UPA Government for its failure to secure the Ramjanmabhoomi complex at Ayodhya and accused the Centre and the Uttar Pradesh Governments of playing the blame game. " The attack in Ayodhya is an attack on our cultural ethos and national pride ," he said. The BJP chief had to cut short his speech and leave the venue as police resorted to lathicharge and fired teargas shells to disperse the protesters. Amid shouts of "Jai Shri Ram," a large number of BJP activists including senior leaders Sushma Swaraj, V.K. Malhotra, Madan Lal Khurana, Vijay Goel and Harsha Vardhan, courted arrest. Interestingly, while Mr. Advani was addressing the BJP activists, workers of the Vishwa Hindu Parishad and the Bajrang Dal held a separate demonstration, which was addressed by their senior leader, Acharya Giriraj Kishore. Elsewhere, Sangh Parivar activists stormed the Indore airport in Madhya Pradesh, clashed with the police at several places and blocked rail and road traffic in protest against the terror attack in Ayodhya. VHP activists breached security and gained entry into the Indore airport, squatted on the tarmac and prevented a Delhi-bound Jet Airways flight from taking off for over two hours. Prohibitory orders were clamped in Chattripura locality of Indore as a precautionary measure. In other State capitals like Patna and Bhopal, VHP and BJP activists burnt effigies of the UPA Government, holding it responsible for the attack on the disputed complex. The nation-wide protest and bandh call, however, did not have much impact outside the BJP-ruled States, according to reports received here. No untoward incident was reported from Uttar Pradesh and the twin cities of Ayodhya and Faizabad. Schools and business establishments remained open but the attendance was thin. BJP spokesperson Prakash Javadekar said the party’s protest call had evoked a "massive response" and reflected the public determination to fight terrorism. Former Prime Minister Atal Bihari Vajpayee asked the Government to clarify how the terrorists managed to reach Sita Rasoi when the entire campus was fortified.